Today we will test the kit Waveshare consisting of a touch screen 7 inches (1024×600 pixels) and an acrylic support in the back of which it is possible to install a Raspberry Pi or another Mini PC. In the previous two articles, we discovered the ePaper screens from the Chinese manufacturer Waveshare (2.7” ePaper screen test and a weather station project connected to Jeedom). 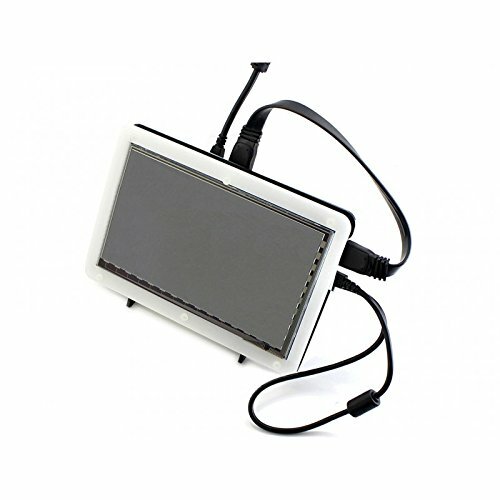 Waveshare also manufactures a full range of LCD / TFT touch screens for the Raspberry Pi (all models). These screens are also compatible with Windows, Linux and other mini-PCs such as the Banana Pi. By compatible, I mean that Waveshare is developing the drivers supporting the touch screen function for Windows, Debian (x86 and ARM). To make this tutorial, I used the kit 7 ” marketed for about €45 / $55 on Gearbest (excluding shipping and without the Raspberry Pi 3) and followed the steps on the official Waveshare WiKi. Begin by removing the sheet of protective paper on each piece of acrylic structure. We will start the assembly by the inclined foot. As you can see, there are two angles of inclination. To assemble the foot, a screen must be inserted into the white crossbar slot. The two pins are inserted into the housing on the vertical sides. We finish the assembly by screwing the black screw M3. Take the white frame. The notch in the frame down (it allows the passage of the web of the touch system). Insert a white screw into each hole. On the other side, place a white nylon spacer. Position the screen inside the frame. Place a new spacer. Then prepare the fixing of the Raspberry Pi. For the Raspberry Pi 3, use the holes # 2. Turn the back plate so that the side notch (HDMI and USB cables) is on the left and up. Secure the 4 spacers with an M3 nut. Then attach the Raspberry Pi 3 (HDMI output upwards) using 4 M3 screws. Place the back plate on the screen and complete the assembly by screwing the 6 nuts onto the white screws. Hand tighten. Now connect the screen to the Raspberry Pi using the HDMI cable and the micro-USB (touch) output to a USB port of the Raspberry Pi 3. That’s it, the editing is over. At the first start, it is necessary to modify the configuration of the display. Here is the picture you will definitely get when starting Raspbian. Save with the key combination CTRL + X then Y and reboot the system with the sudo reboot command. The configuration is almost the same from one screen to another. It will be necessary to indicate the resolution and the refresh rate with the parameter hdmi_cvt. On the official Wiki, it is indicated that you must add this line option “CalibrationMatrix” “0 1 0 -1 0 1 0 0 1” below the option MatchIsTouchscreen “on”. Do not do this unless you have changed the orientation of the screen. #Option "CalibrationMatrix" "0 1 0 -1 0 1 0 0 1"
If you need to orient the screen, here are the calibration settings to insert into the configuration file. It is necessary to restart the system after each modification. This 7 inch diagonal LCD is of good quality. The touch system is accurate and responsive. At times, I noticed the appearance of streaks that move quickly from bottom to top in less than a second. I did not find the source of the problem. It may just be the power supply of my old PC that I use to develop in 32-bit Linux that is the cause. The acrylic support delivered with this screen is a real plus. For less than €45 / $55 on Gearbest (excluding postage and without the Raspberry Pi 3), we have a complete display solution for the Raspberry Pi.